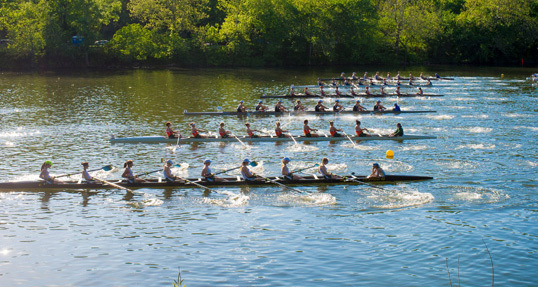 The Ohio State Buckeyes captured their first team title in 2013, but NCAA rowing at the Division I level is a densely packed field—the most difficult in which to defend a title in all of collegiate rowing. While the Buckeyes are returning most of their 2013 squad, they’ll be up against a Virginia team that is reminiscent of the Cavaliers’ 2012 campaign. And the Golden Bears of California will be looking to carry the momentum from a varsity eight win in Indianapolis into the 2014 season. The field at the Division II level has been extremely volatile over the past two seasons, with first-time champions breaking through in both 2012 and 2013 following a long stretch of dominance by Western Washington. While the Vikings will likely always be in the conversation, the center of power in the DII ranks appears to have shifted to the opposite side of the country: Florida. While Barry had the better of the rivalry during the regular season in 2013, it was Nova Southeastern that had the last laugh. The Ephs of Williams have made a habit of setting the bar high and keeping it there, and while they had a coaching change prior to the 2011-12 season (in fact, the Ephs streak of eight straight NCAA titles has been under four different head coaches), Kate Maloney has shown that she was more than ready for the task. Still, like Division II, there have been challengers on the rise—most notably Bates, who pushed the Ephs all the way to the line in Indianapolis last spring only to come up just two seconds short. Look for that rivalry to continue to develop this season, as well as other emerging challenges from William Smith and Trinity. University of California, Berkeley dominated the varsity heavyweight men’s field, winning the Copley Cup at the San Diego Crew Classic last weekend and taking sole possession of the number one spot in the second USRowing Coaches Poll.